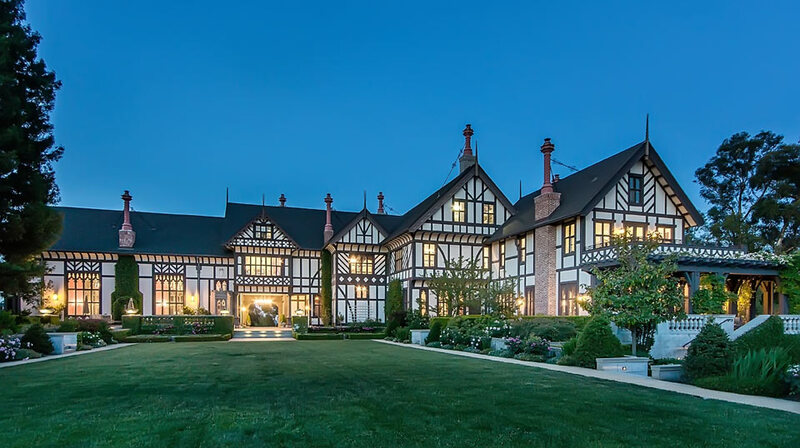 Located in Los Altos Hills, a premier neighborhood in the heart of Silicon Valley, this approximately 30,000 square foot estate is situated on approximately eight manicured acres. A majestic wrought iron gate brought in from a Southern plantation opens to a long private driveway which meanders through the mature oak trees and leads to this impeccably restored estate. The splendid English exterior is bisected by a porte-cochere separating the living quarters and a grand ballroom. The opulent interior includes a formal living room with Italian style 12 foot beamed and paneled ceilings, antique carved marble fireplaces, a ballroom with 16th Century gilded Venetian ceiling paintings said to be from the Palazzo Grimani, a grand oak entry stair hall with plaster ceilings, library with mahogany bookcases and a “secret” room with wet bar and beer taps. Intricate inlaid hardwood floors can be found throughout. The gourmet kitchen with mahogany island and onyx counters boasts the latest modern epicurean features. A sun soaked breakfast room with Gothic arch windows overlooks the estate and rolling hills beyond. The magnificent estate features architectural detailing and craftsmanship rarely found in homes built in recent generations. The museum quality millwork and California Oak paneled walls provide architectural interest while the hand carved fireplaces provide warm focal points. The ceilings are all individually designed and fabricated by European craftsmen and artisans. The seamless blend of old world luxury and twenty first century sensibility is evident in the home’s systems including climate control, entertainment, lighting, connectivity and security which are all state of the art and are not intrusive to the period detailing. An outdoor kitchen is complete with an Alfresco dining area that overlooks the estate and nearby rolling hills. Two outlier buildings include a spacious gym, utility building and a caretaker’s house. A motor court and underground garage can accommodate over twenty vehicles. Tall ceilings, abundant natural light, and exquisite finishes appoint every room from the formal and everyday spaces, to the bedrooms, and versatile recreation areas. The home’s panoramic Bay views through signature curved walls will be the center of conversation during social gatherings, and festivities will undoubtedly move downstairs to the fully customized movie theatre, wine cellar, and recreation room. Outside on the grounds of approximately 1.37 acres, a vast entertainment terrace with a full kitchen and fire pit allows for al fresco entertaining, beside a magnificent pool and spa that put the finishing touch on this once-in-a-lifetime estate. Throughout the design, picture windows blur the boundaries between inside and out, framing vistas that stretch for miles. French doors segue to several al fresco venues, including an intimate fountain courtyard situated off the dining room. Easily catering it all is a tremendous chef’s kitchen and butler’s pantry – an unparalleled center of true epicurean delight. Rounding out the accommodations are two dedicated offices, a customized cinema, recreation room, wine cellar, gym, and art studio. The home’s personal accommodations are comprised of 4 upper-level bedroom suites, including a stunning master suite with glorious views, plus a lower-level suite. For extended family living, guest, or added entertaining space, a 1-bedroom, 1-bathroom guest house is equally luxurious and well appointed. Completing the residence is an attached and fully finished 2-car garage plus a detached 4-car garage. The seven-year restoration was undertaken with great care and a commitment to world-class standards that would preserve the homes priceless artwork and craftsmanship. The estate and grounds were transformed into a warm, welcoming home for family and friends as well as a magnificent gathering place that inspires grand entertaining. The estate honors its past splendor and enjoys modern sensibilities, perfect for both world class entertaining and intimate family gathering. Architect Richard Beard drew the master plan for the restoration. Utmost attention was paid to preserving the beauty and grandeur of the estate. Materials were imported from all over the world. Stones from the Indian sub-continent and France, fabrics and upholstered furniture from England and France, carved statuary and fireplaces (some dating back to the 17th century) from Italy, a majestic iron front gate from a plantation in Georgia, plantings, trees and landscape foliage from all the western United States. 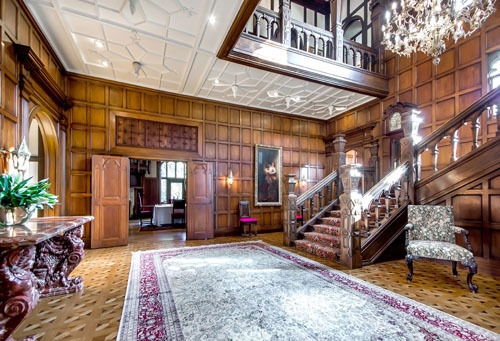 This historical landmark estate is truly a one of kind property rarely available in the US.